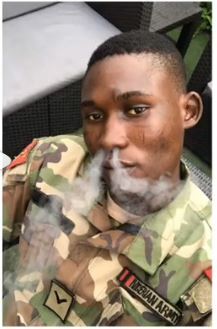 A soldier who was dismissed from active duty found terrorizing Ebute Meta, Lagos, has finally been arrested after months of harassing unsuspecting residents of the area, with the help of his former colleague who is still in active service. The suspect identified by a nickname “One bullet” was arrested after he went to raid some suspected yahoo boys with the help of some SARS officers. After the raid, they extorted their victims of N220,000 and an iPhone X. However, Huskey, a friend of the victims, reported the matter at the Bonny Camp soldier barracks and some officers were deployed to take up the issue. One bullet was subsequently arrested and now cooling his feet in detention.